Up to a thousand Nazi Waffen-SS veterans and their supporters have marched through Latvia’s capital, Riga, in their annual commemorating procession. In response, Latvian anti-fascists came out to “clean up” the route. 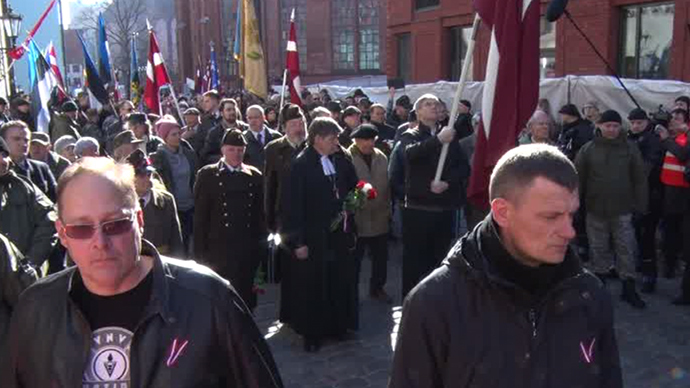 The march of the SS veterans started in Vecriga, in Riga’s old town, at 11:00 local time Monday after a religious service. The participants, holding the national flags of Latvia, Lithuania and Estonia, walked through the city to the Monument of Freedom, where they lay flowers. Many veterans wore uniforms of the legion and pre-war uniforms. The use of Nazi and Soviet symbols was forbidden in the parade and the participants were not allowed to veil faces. The annual march causes controversy among various social groups. Anti-fascist and Jewish organizations, such as the Simon Wiesenthal Center, believe such rallies glorify Nazism. Zuroff says the participants of the march are often associated with the fight for Latvia’s independence. Numerous policemen were present at the march and also a private security agency’s employees as the authorities expected confrontations with local anti-fascist organizations. Latvian Interior Minister Rihard Kozlovskis had earlier called on the residents to stay away from the city center unless absolutely necessary. The US Embassy in Latvia also recommended its citizens to pay more attention to security. Anti-fascist activists staged a protest, wearing white overalls and pretending to “disinfect” the area from the “Nazi disease,” cleaning and washing the pavement near the Freedom Monument. Other participants displayed photos from concentration camps in Latvia. Russia has condemned the holding of the Nazi veterans’ march as a violation of international law. “This is a direct contradiction against the ruling of the Nuremberg Trials,” Konstantin Dolgov, the Russian Foreign Ministry's human rights ombudsman, told the lower house of parliament, the State Duma, in Moscow. The Latvian legion of the Waffen-SS consisted of almost 150,000 Latvians and was split into two divisions. The legion was created in 1943 on the orders of Adolf Hitler. In March of the same year, the legion was already battling the Soviet Red Army near the town of Pskov. It was among the last of the Nazi forces to surrender in 1945. The Waffen-SS march has been held annually on March 16 since 1998, although it is not an official holiday. Latvia’s national day of remembrance for war heroes is on November 11.